Set in the lush grounds of the exclusive Pantai Lima Estate, Villa Ambra offers tropical beachfront elegance. This 5-bedroom luxury villa has multiple lounging and dining areas, two interconnected pools, a garden Jacuzzi and 45 metres of beach frontage with only the occasional fisherman or surfer strolling the sands. Private and peaceful, this is the perfect spot for those looking for a serene seaside escape. The owners of Villa Ambra stay here for a few months of every year, so they have designed the space to be a genuine home away from home. The design and decor is warm and welcoming with a mix of natural elements like smooth polished wood floors, stone walls and alang alang thatched ceilings, and the furnishings are not just attractive, but comfortable and functional as well. It’s all about sea breezes, rolling waves and black sand here, as each of the bedrooms has scenic views of the Indian Ocean, and you can step directly off the lawn onto the beach. In addition, the outdoor lounge areas overlook the sands, meaning you can enjoy breakfast, lunch or dinner amid fresh air and sparkling sunlight, or indulge in sundowner cocktails at day’s end. Villa Ambra has plenty of places to gather the group, as there are two sitting rooms, one on the ground floor and one on the upper floor. Both have large sofas with soft cushions, reclining chairs and strategically placed coffee tables, and they are open-sided to allow breezes and light to flow in. There is also an air-conditioned dining room on the ground floor with French doors, a home cinema with a flat screen TV and DVD collection on the lower level, and a private study with books, games and an iMac computer with a printer. The five bedrooms at Villa Ambra are spread out among the two multi-level buildings, and each has its own unique ambiance and design. They all feature private balconies or terraces with views out to sea, walk-in dressing rooms, comfy double or queen beds and ensuite bathrooms with bathtubs and monsoon showers. Three of the bathrooms are even semi open-air. Outdoor living is a given here, as the villa has been built to blend into the natural surroundings and the beautiful gardens boast a huge 100 square metre infinity pool that is connected to a smaller 12-metre kid’s pool. Outside you will also find a barbecue on the pool deck, a Jacuzzi that can fit eight adults, a covered relaxation bale, and a dining and lounging area overlooking the sand. 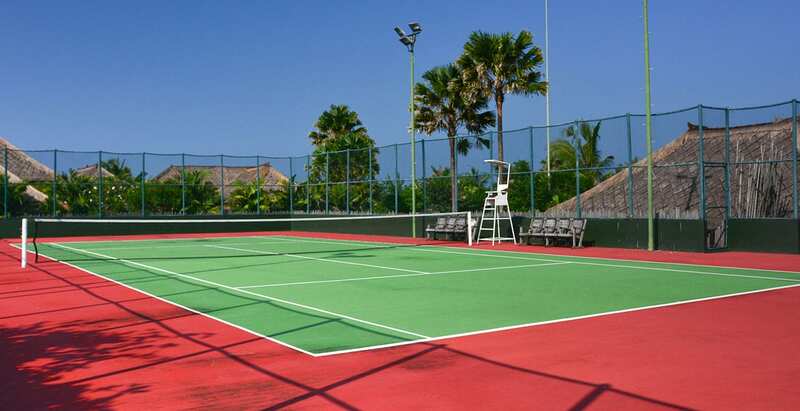 Moreover, guests have access to the shared tennis court, gym and seminar room within the Pantai Lima estate. CAPACITY 10 people (5 bedrooms: 4 x king, 1 x queen). LIVING AREAS There are two living rooms. The first, at ground level is 80 square metres; the second, upstairs is 45 square metres. Both catch refreshing sea breezes. State-of-the art blinds allow the living areas to continue to be used in inclement weather. A dining room, which seats ten and comfortable lounging and dining areas right at the edge of the beach, as well as a shady bale to relax in, all provide unobstructed ocean and sunset views. POOL Main Infinity Pool 20 x 5 metres. Children's pool 21 sqm, and with a maximum depth of 60 centimetres, At the end of the main pool, very near the beachfront, is a jacuzzi which is designed for the enjoyment of up to eight adults. STAFF Villa Ambra has 17 wonderful staff, with 365/24 attendance, including a Villa Manager, Head and Under-Butlers, Chefs, Houskeepers, Engineers and security. COMMUNICATION There is unlimited centralised WiFi broadband internet throughout the estate. Every bedroom has an ISD capable telephone. Local and international calls will be charged at cost. Fax facilities are available on request. ENTERTAINMENT Private cinema with large selection of DVDs. Library well stocked with books, games, and jigsaw puzzles, and an iMac with printer. FOR FAMILIES The second pool is a child shaded pool with a max depth of 60cm. Your kids can play in the water for hours without any risks of sunburn. Babysitters upon request. Baby cot and high chair available. ADDITIONAL The outdoor heated jacuzzi is designed for the enjoyment of up to eight adults, BBQ. Mountain bikes, kites, and fishing rods. The Estate has a Tennis court with night lighting, a Gym and 250 square metres seminar room. 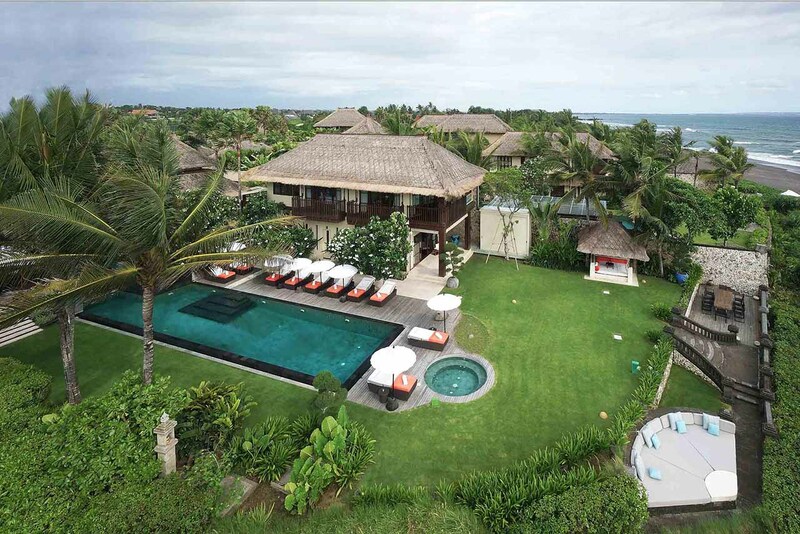 Villa Ambra is located right on the famous sunset beach of Pererenan, Canggu, Bali. There are plenty of things to do in Bali if you choose, and the Villa Manager will be more than happy to arrange things for you. If anyone knows of a better house in a prettier location with a friendlier, happier and more professional staff - anywhere in the world - please let me know! Villa Ambra and staff is literally off the charts. Our family experienced a week like no other in our lifetimes. Having stayed at Pantai Lima Estate for the past 5 years in different villas, this year we were unable to get Villa SoS so were offered Villa Ambra as they had the dates we wanted available, Initially we were a little disappointed as we have now stayed in Villa SoS for 3 years and the staff there have always been faultless.. However on arrival with our group of 11 we were met at the Airport By Putu the Villa Manager along with the 2 cars and a Luggage van (the luggage van was given at no extra cost) we had lovely cold water and a very cold towel which was appreciated. On arrival at the Villa we were met by Ketut who i have met previously as she had worked in one of the other villas we had stayed in.. She is just one of the nicest people you will ever meet.. Ketut and Putu made our stay memorable and nothing and i mean nothing was ever to much.. The place is paradise personified and the owners have done a fantastic job furnishing the rooms as well as the little touches and the gardens are just stunning! Our sundowners were done each evening on the edge of the villa with views to die for... The food was phenomenal... I do not think we had a dish in the 7 days that we were there that was not a crowd pleaser... thats an accomplishment when you have 11 people in the group The staff are unobtrusive but attentive above and beyond I cannot pick just one staff member as they are ALL excellent, the chef, kitchen staff, drivers, waiters, garden staff just everyone made our trip. We have rebooked again for Villa Ambra for next year and this time are extending our trip for a few extra days! My husband and I had the most amazing stay at Villa Ambra. From the moment that we were picked up from the airport, we were treated like king and queen. Fragrant towels and cold water were offered while on the way to Villa. When we arrived, we were greeted by the most delicious virgin mojito and a wonderful smile. The rest of our stay was as tasty as the mojito:). Staff were friendly and professional. Our room was furnished with the most high standard (especially the pillows, much more comfortable than my husband's chest) and in a calming oriented theme. Open up to the beautiful sea view and the pool is just by our door step. I was surprised that we even received free laundry service, what a big plus:). The owner has 2 cars with drivers that we had the convenience to visit town as we wish. As a foodie myself, a big compliments to Chefs. Every meals were simply sensational. All in all, it was the prefect holidays. Thank you for Villa Ambra giving us the taste of paradise. We very much look forward to our next return. I recently had the most wonderful stay at the Villa Ambra (one of the various villas on property with the beach at its doorstep). Once you stepped in everything was spectacular! the staff were very attentive, friendly, and paid attention to detail. The layout and décor of the whole place were of great design and high quality. My favourite dish was the pomelo salad and of course had to finish every meal with their delicious home made ice creams... I would say awesome value for money considering all the services that are provided (free bike rental, laundry, driver (excl. petrol), WiFi, chef, 24 hour butler...)! I will definitely be back! Villa Ambra has been a jewel find, a little piece of paradise. The location is exquisite with fantastic views overlooking the beach and spectacular sunsets - make sure to have cocktails on the sunset lounge. The staff are impeccable and the quality of the food is hard to beat. The Villa has been decorated in keeping with the island feel - but no comfort or luxury spared ! You will get just the right amount of privacy. We would walk to echo-beach along the beach front from the villa. The only down side is that you are so well taken care of that one forgets to enjoy the rest the island has to offer... however the Villa has at its disposal up to 2 very comfortable cars [plus driver] that can be arranged with the staff, to make your movements to-and from the villa seamless. We've been there with friends and family and will be returning at the next opportunity.